After her 11-year-old son, Max, took his shirt off during a swim outing, Allison Fisher’s instant, alarming thought was: diabetes. “He was so thin, I could see his ribs. It looked like he had lost 20 pounds,” says Fisher, who booked a doctor’s appointment, knowing her son had already been showing other warning signs, such as excessive thirst and frequent urination. Hours before that visit, Max slept through recess. During the appointment, their pediatrician diagnosed Max with type 1 diabetes (T1D), and said that either they could drive to the hospital right then or he’d call an ambulance. Max should have been dead or at least in a coma by the time they arrived at the hospital, because his blood sugar reading was at a life-threatening level. He was in diabetic ketoacidosis (called DKA), an extreme condition that happens when the body does not make enough insulin, a hormone required to help glucose enter the cells for energy. In making her sugar-free promise, Fisher had confused T1D, an autoimmune disease characterized by the pancreas’ inability to produce the insulin that regulates blood sugar, with type 2 diabetes, a disease often related to lifestyle choices and obesity. On average, about 50 people are diagnosed with type 1 diabetes each day in the U.S. National data suggests that about four out of 1,000 students within an average high school senior class has the disease. Upon diagnosis at Seattle Children’s Hospital, a child spends an average of three days in the hospital while his body’s blood sugar level begins to be regulated by injections of insulin. Meanwhile, parents attend a series of classes teaching them how to read food labels; count carbs and figure out premeal insulin doses; give shots and load insulin pens; work out the math equations necessary for administering the correct dosage of insulin for their child; and what to do in times of emergency, such as low blood sugar. Increasingly, families are turning to new methods, fueled by the advances in and easy availability of technology, for managing this chronic disease. “A miscalculation could kill your child. I cried during the diabetes math class; it’s algebra and ratios and percentages and decimal work. Thank God tech does a lot of the work for us now,” says Fisher. New tools for delivering insulin and monitoring blood sugar, apps for calculating and measuring and even social media are giving parents and children more information about the numerous daily decisions that come with T1D. But what comes packaged with progress? When is the latest gadget one tool too many? Here’s how local families deal with living with T1D today. After a child is diagnosed with T1D, the family is given insulin, which parents administer by syringes or insulin pens as they learn the specific physiology of their child’s body and disease. Eventually, many caregivers switch from using syringes or pens to an insulin pump system, a battery-operated device a bit bigger than a pager that pumps insulin into the wearer through a tube ending in a cannula or a needle inserted into the skin. Some pumps are tubeless. While the pump is revolutionary — designed in the 1970s and refined (roughly 20 percent of people with T1D in the U.S. now use one) — doctors, parents and patients must actually program the pump, telling it how much insulin is needed based on patterns of blood sugar readings, amount of carbohydrates consumed and time of day. 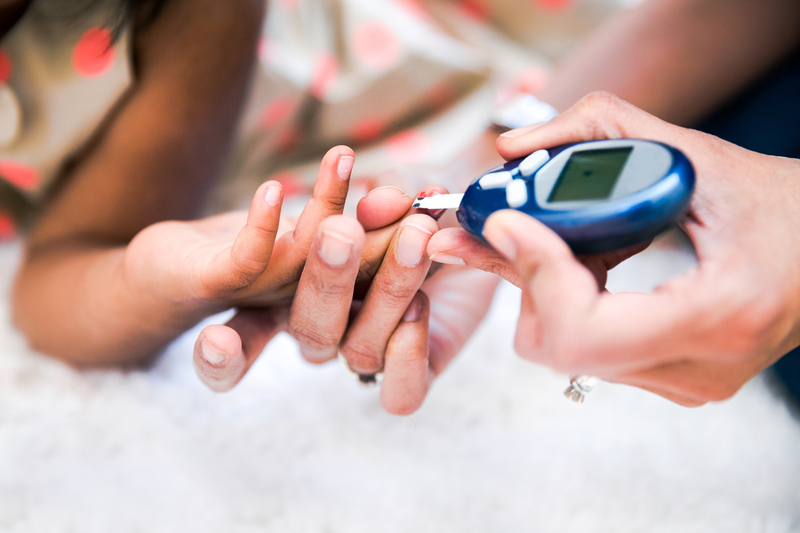 This is why people with diabetes poke their fingers; they’re checking their blood sugar level and then employing mathematical calculations to determine how much insulin they need. A more innovative technology came onto the market in 1999, allowing some kids with T1D to also wear a continuous glucose monitor (CGM), inserted under the skin, which measures glucose (sugar) levels in the body in real time 24 hours a day. Families and doctors hope that eventually this technology might evolve and lead to fewer finger pricks, but as of right now, while a CGM adds data, it’s also yet another thing to wear on the body. That’s why Anna, 15, who was diagnosed with T1D at age 2, has never worn a CGM. Although her parents switched from needles to insulin pens and finally to using a pump to administer insulin when Anna was in first grade, the CGM sensors that come with her pump remain in storage. “Anna has great control with the pump, and she’s great at checking her blood sugar. She has such a little body and she doesn’t want another site on her body,” says her mom, Erica Stowell, who lives in Seattle’s Ballard neighborhood. Stowell says it was enough of a challenge to figure out where Anna would wear her pump when she donned a fancy dress for her school’s winter ball. Still, many families embrace CGM, because the sensors connect to transmitters that send a sugar reading every five minutes or so to a display device that the user carries. These days, the patient’s device can instantly share this vital blood sugar reading with parents, thanks to that magic tech “cloud” and the smart devices that so many people have. Leslie Raines has two young sons with diabetes, and this technology means she is no longer physically tethered to Marlowe, 9, and Oliver, 6. “Although they don’t always wear their CGMs — the needles are stiff, and insertion hurts — when they do, I sleep with their monitoring devices, and they wake me with an alarm if their blood sugars are way off. When they don’t wear their CGMs, we physically check their blood sugars at 12, 3 and 6 a.m.,” says Raines, who lives in Seattle. Omnipod pumps, which are tubeless and deliver insulin, “have helped the boys’ blood sugar levels stabilize, given them more freedom and been life-changing for us all,” Raines says. Living with T1D as a child means that the child’s school must either have a nurse who is trained to work with students with diabetes or another adult at the school who has been trained in diabetes care — a parent-designated adult, or PDA. Raines writes the carb counts on her sons’ lunches, and they visit the school nurse before meals, tell her what they are most apt to eat and the nurse gives them insulin based on this information. As children grow, they’re increasingly learning to maneuver emerging T1D technology, building critical independence they’ll need later. A teen using the CalorieKing app on his smartphone can check carb counts on more than 70,000 foods. Yet parents are still intimately involved, even as technology helps. For instance, social media contracts take on new meaning when you’re asking a teen to share his CGM readings with you 24 hours a day. Caregivers involved in T1D have long joked about being an “artificial pancreas,” but researchers are now working on the technology to create just that. A new hybrid closed loop system called the MiniMed 670G, developed by Medtronic, will be on the market this spring and has been approved by the FDA for older children and adolescents. With this system, the insulin pump and the CGM will essentially talk to each other, meaning that the CGM’s sugar readings are popped into algorithms that tell the pump how much basal insulin to give the body, and this process happens automatically, without patient input. Patients and parents will still need to manually tell the pump how much bolus (fast-acting) insulin to give the body before a meal. While this type of technological advance changes the landscape of T1D management to a degree, parents will be the first to tell you that the MiniMed 670G is not really an artificial pancreas. “We have the hardware that it takes to create an artificial pancreas, and the communication pathways for the pump and the CGM to talk to each other are there, but a true artificial pancreas needs an algorithm to determine dose, as well as stable glucagon [the hormone that raises blood sugar], and the FDA hasn’t approved any system that uses glucagon yet,” says Fisher. Currently, glucagon is a drug that can save a person with T1D when their blood sugar is extremely low. People with T1D and parents of kids with T1D carry glucagon with them at all times (and stash extras in backpacks, purses and glove compartments). Glucagon is packaged as a “kit” containing a liquid that must be mixed with a solid before being administering; this is to avoid hypoglycemia, a potentially very serious condition that can cause loss of consciousness, seizures and, on rare occasion, death. When the market doesn’t deliver solutions fast enough, some parents start thinking like scientists, creating their own do-it-yourself solutions, such as a hybrid closed loop system, at home. Seattleite Dana Lewis, who has lived with diabetes for 14 years, worked with Scott Leibrand to create her own hybrid closed loop system with her existing medical devices. Then she decided to share it with the world: The Open Artificial Pancreas System project aims to make safe and effective basic artificial pancreas system (APS) technology widely available to anyone with compatible medical devices who is willing to build their own system. While this isn’t FDA-approved technology, Lewis points out that they aren’t selling medical devices, but posting code and documentation online. Seattle parent Carlin Pressnall and her husband, Matt, used OpenAPS to build a hybrid closed loop system for their daughter Ella, 11. They were user no. 28 on this project, which at press time had 174 users worldwide. When the market doesn’t deliver solutions fast enough, some parents start thinking like scientists, creating their own do-it-yourself solutions. “When you manage diabetes, you realize how many decisions you are making in a day, especially at 3 a.m. after rolling out of bed. A computer can use algorithms to make those decisions every minute and make them in a very slow and safe way. A computer can be way more diligent than parents,” says Pressnall, who lives in Seattle. While Dr. Taplin understands the motivation of people who have turned to a system such as OpenAPS, he doesn’t recommend that parents of a child with diabetes build their own hybrid closed loop system. But by demanding better solutions, he says, parents of children with T1D are helping to drive the diabetes technology sector, likely moving products such as the MiniMed 670G more quickly toward formal regulatory approval. Parents with T1D experience and software expertise are even working with device companies and research teams to create solutions that result in brand-new technologies,” Taplin says. One of those companies is Bigfoot Biomedical, a California company founded two years ago by four fathers of children with T1D who were dissatisfied with the pace of traditional industry development. These dads had the technical and business expertise to create, develop and commercialize a comprehensive solution, says Melissa Lee, Bigfoot’s director of community relations. The company’s insulin delivery system, the Bigfoot smartloop system, is currently undergoing its first FDA-approved trial. “We recognize, respect and reflect the unrest of the people impacted by T1D who said, as our cofounder Lane Desborough first coined, ‘We are not waiting.’ We believe that the DIY community has helped industry recognize the needs and desires of the end user of these devices,” says Lee. This very connected community doesn’t just live in the virtual world. ConnecT1D was founded in Seattle in 2009 with the belief that life with a chronic illness is just a little bit easier if you know somebody else going through it at the same time, says Jake Johnston, one of ConnecT1D’s founders who has T1D himself and also has a 11-year-old daughter with T1D. Wanting to create real-world social and community connections and support, ConnecT1D achieved nonprofit status in 2011, and proceeded to launch a parent program, a teen program and an adult program, and went on to host its first Family Camp in 2012, which today serves more than 60 families. ConnecT1D receives dozens of emails and calls every week from people seeking support. “There’s ‘OMG, we were just diagnosed and we’re overwhelmed’ to ‘There’s nobody else in our town that has this disease.’ Some of our most important work is hosting parents’ night outs so parents can talk to each other,” says Johnston, who lives in Seattle. As a person with T1D and the parent of a child with T1D, Johnston admits he hasn’t been this excited about technology in decades. He says hybrid closed loop systems and eventually an artificial pancreas would mean fewer sleepless nights for parents. Still, it’s not just technology that encourages him.